The DFB-Pokal (German Cup) semifinal draw took place at the German Football Museum (Deutsches Fußballmuseum) on Sunday evening. 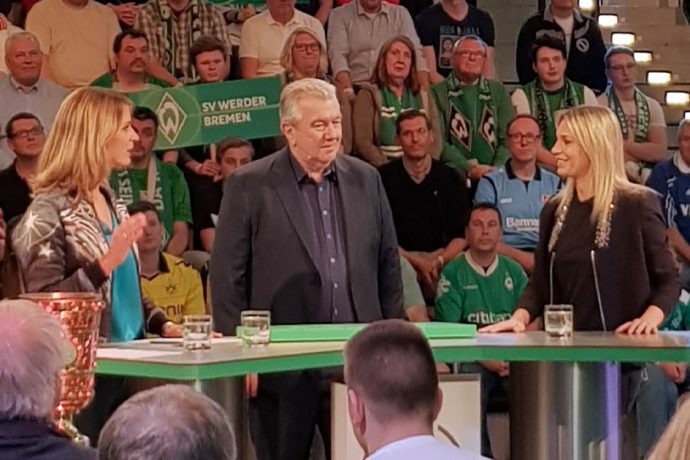 The draw was carried out by Germany Women’s national team and VfL Wolfsburg star Lena Goessling in a live broadcast on German national television channel ARD. The 33 year old defensive midfielder was accompanied by German FA (DFB Deutscher Fußball-Bund) Vice President Peter Frymuth who oversaw the proceedings. Jessy Wellmer was the host of the live broadcast. The semifinal draw produced two exciting fixture to be played on April 23 & 24. Werder Bremen will host record champions FC Bayern Munich at the Weserstadion, while RB Leipzig travel to Hamburg to face the only remaining Bundesliga 2 side. The DFB-Pokal final is scheduled for May 25 and will be traditionally hosted at Berlin’s Olympiastadion.